Medicare consulting firm 65 Incorporated was looking for a strong PR push to begin Medicare’s annual open enrollment season. 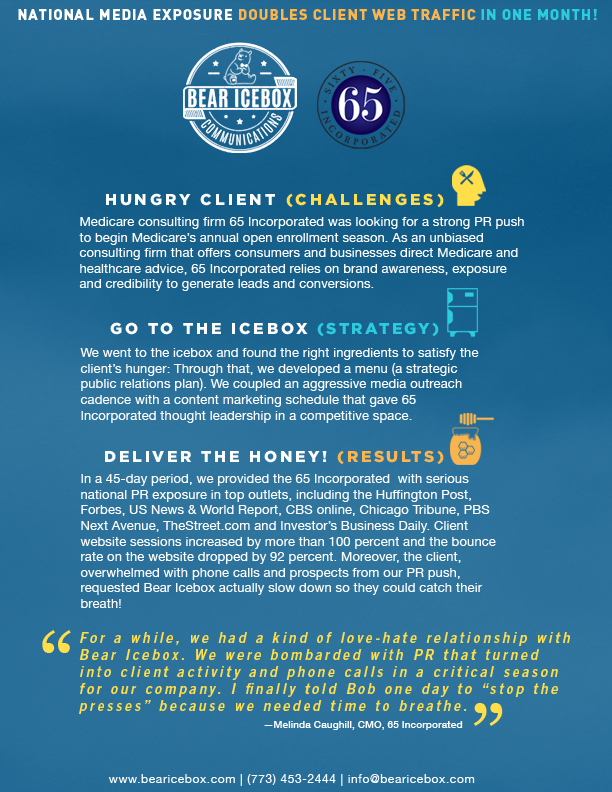 As an unbiased consulting firm that offers consumers and businesses direct Medicare and healthcare advice, 65 Incorporated relies on brand awareness, exposure and credibility to generate leads and conversions. Our strategic public relations plan coupled an aggressive media outreach cadence with a content marketing schedule that gave 65 Incorporated thought leadership in a competitive space. In a 45-day period, we provided the 65 Incorporated with serious national PR exposure in top outlets, including the Huffington Post, Forbes, US News & World Report, CBS online, Chicago Tribune, PBS Next Avenue, TheStreet.com and Investor’s Business Daily. Client website sessions increased by more than 100 percent and the bounce rate on the website dropped by 92 percent. Moreover, the client, overwhelmed with phone calls and prospects from our PR push, requested Bear Icebox actually slow down so they could catch their breath!